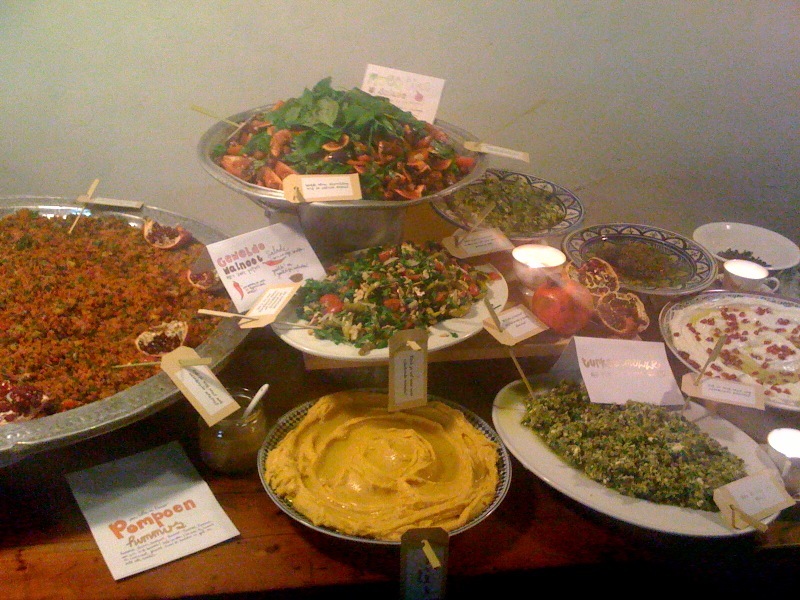 Last night we had our wonderful dinner at Marije Vogelzang’s Proef! with as special guests our dear friend Kamal Mouzawak from the Lebanese farmers market Souk el Tayeb in Beirut. In may and july we were cooking at Tawlet, his new restaurant in Beirut’s Mar Michael and now we were so happy to be cooking with him again in Amsterdam in this special location. And proud of course, since Kamal promoted us this summer as being Souk el Tayeb’s family. And whoever has been in Beirut and visited Souk el Tayeb’s wonderful saturday’s market knows how honoured we feel to be part of it! As soon as we have all pictures we’ll put them here, with the menu, explanation and all. But now back to a week ago, to another wonderful dinner at Proef, see the menu of the post before. Cooking that night was great fun, because our new friend Lotte came to help us, and it was fluent! So we came to some great adjustments of Bismilla Arabia recipes: our bread & butter pudding with dates & orangeflowerwater transformed from delicious to fantastic. This was the trick. The dates were a bit hard, so we soaked them in some warm water with orangeflowerwater, they became fragrant and moist, instead of only sprinkling the pudding with the orangeflowerwater later on. Then we almost burned our almonds in the oven: because they were already quite brown we didn’t want to mix them in, instead we used some grated white almonds to mix in with the bread and cream or milk. Lotte came with an excellent solution, she pounded the toasted almonds in the mortar and grinder to a coarse powder and we sprinkled them on top. It was sooo delicious we even forgot to take a picture of this new version. So the picture is the ‘old’ one from the Bismilla Arabia book! 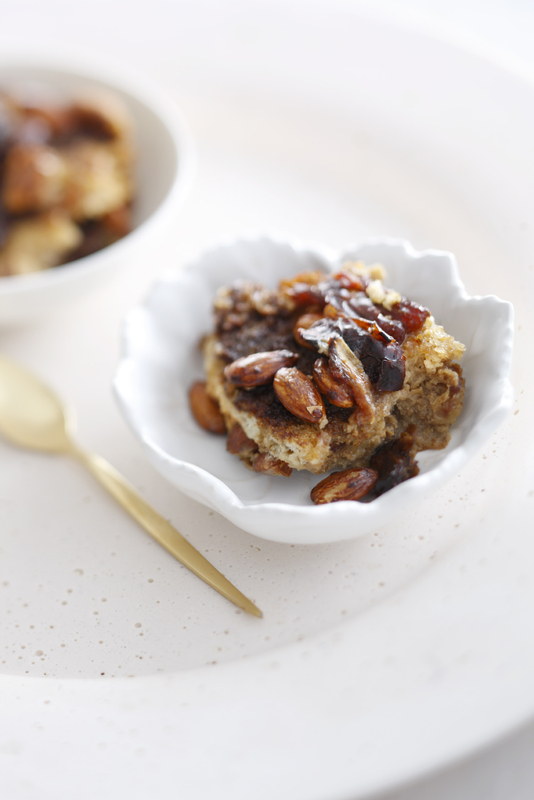 When we think of the Sahara, we think of dates and bread: the inspiration for this bread pudding that you can use again as a power breakfast or after a light dinner, full of energy from almonds and dates. Preheat the oven to 180 °C. Divide the bread into pieces. Stone the dates and pull them apart, sprinkle them with some warm water en orangeflowerwater. Whisk the milk and the eggs and soft butter. Mix with your hands the pieces of bread with almonds, dates, milk mixture, and a dash of date syrup. Spoon in a greased baking dish, sprinkle with some date syrup and if you like some more orangeblossomwater. Bake the bread and butter pudding for 30-40 minutes until golden brown. Pound the almonds in a mortar and grinder and sprinkle over the pudding. EAT WARM!